Whether you wear them together or apart, these pieces from Mimikri are the perfect summer items. The pieces are offered in many different seasonal tropical colors. I’m sure you’ll be able to find a combination that suits just you. They’re available from Cosmopolitan. (The corset also comes with a gold eyelet version.) 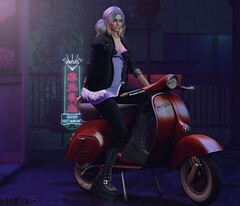 I also love, what I consider an ideal jumble of casual hair, Lamb’s most recent release at FaMESHed. It can be styled in several different ways. I’m wearing one of the blondes from the Ombre pack.